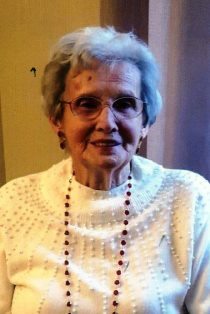 NASHUA- Imelda C. (Jacques-Croteau) Fluet, 94, of Nashua, died peacefully Friday, August 31, 2018 at the Courville Nursing Home. She was the wife of the late Jean-Marie Fluet who predeceased her in 1991. Imelda was born in St. Honore, PQ Canada on August 21, 1924 and was the beloved daughter of the late Cleophas and Yvonne (Roy) Jacques. Imelda enjoyed playing cards, cribbage and bingo. Most of all, she enjoyed spending time with friends and family at the many outings they shared. Imelda is survived by three daughters; Ginette Bedard and her husband Pierre of Hudson, Nicole Lagueux and her husband Claude of Hudson and Maryse Tremblay of Nashua; three sons; Richard Croteau and his wife Francine of Florida, Fernand Croteau of Canada and Jocelyn Croteau and his wife Marie of Tewksbury, MA; twelve grandchildren, Nathalie, Cynthia, Matthew, Steve, Sonia, Sophie, Valerie, Alexi, Vicky, Ivy, Evan and Erick; eleven great grandchildren and one great-great grandchild; One brother Laurier Jacques of Canada; One sister; Fernande Dubois of Canada as well as several nieces and nephews. Imelda was predeceased by her first husband; Roland Croteau, two sons; Jean-Guy Croteau and Jacques Croteau, two grandsons; Jason Lagueux and Dan Bedard, three brothers; Donald Jacques, Leo Paul Jacques, Wilma Jacques and two sisters; Jacqueline Jacques and Yvette Jacques. Relatives and friends are invited to her visitation on WEDNESDAY, September 5th from 4 until 8 PM at ANCTIL-ROCHETTE & SON FUNERAL HOME, 21 Kinsley Street, Nashua. Burial will take place at the convenience of the family. In lieu of flowers, memorial contributions may be made to Home Health and Hospice, 7 Executive Park Dr., Merrimack, NH 03054.